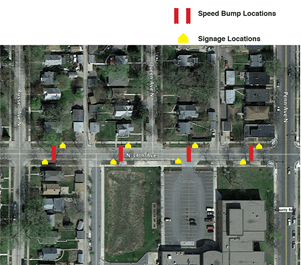 The City of Minneapolis is considering speed bumps on 34th Avenue N between Russell Ave and Penn Ave. This will improve safety for students at Lucy Laney School and others walking or biking to Cleveland Park. This is a part of a federally-funded Safe Routes to School Project serving North and Northeast Minneapolis Schools. Speed bumps reduce the speed of automobiles by an average of 7 to 25 mph. Traffic accidents are reduced. In a study of speed bumps in Portland, OR, accidents went down by 48%. If approached at a reasonable speed, speed bumps do not cause vehicle damage. Signage and pavement markings will be used to alert motorists of approaching speed bumps. Monday, May 6th, from 6-6:30pm Forrest Hardy will be available to answer questions and talk with residents out at 34th Avenue North between Russell and Penn Avenue regarding the speed bumps being proposed there.